The August 1st City Council meeting will be a big night for the Event Center. There are a two resolutions and a 1st reading of an ordinance on the agenda that affect the Event Center planning, construction and an advisory vote. This ordinance will not be adopted on Monday night because it is just first reading which sets the stage for a public hearing. 2nd Reading (Public Hearing) and adoption of this ordinance will occur at a future meeting. There is a proposed resolution on the agenda Monday night that actually addresses the proposed ballot language. Per State law, the Notice of Special Election published by the City Clerk's office is to state the maximum amount of bonds to be issued and the purpose of the bonds to be issued. Why muddy up this ordinance with the ballot language at this point? The ballot language in this ordinance sets out a dollar amount that is still not known. Isn't the purpose of this ordinance to set the date of the "advisory" election? Why not say "advisory" in the ordinance heading? HELD ON NOVEMBER 8, 2011.
of second penny sales tax revenues to finance all or a portion of the costs of the Project. action described in paragraph 1. This resolution is important because the November vote before the public is advisory only. The public has expressed concern about this "advisory" vote and whether the Mayor and City Council would honor the simple majority of the people. This proposed resolution provides the safety net that if the public doesn't approve the Event Center Project, the current City Council will not move forward with the necessary ordinances and resolutions to authorize the expenditures and issuance of bonds to construction the Event Center. A RESOLUTION APPROVING THE FORM OF BALLOT, INCLUDING THE CITY ATTORNEY’S EXPLANATION, IN CONNECTION WITH THE ELECTION TO DETERMINE WHETHER THE CITY SHOULD CONSTRUCT AN EVENTS CENTER. WHEREAS, the Sioux Falls City Council finds it desirable to hold an election to determine whether the voters of the City of Sioux Falls (the “City”) support building an Events Center. Project. No general obligation bonds will be issued. authorized by the current City Council to pay for the Project. associated site improvements (the “Project”) at a Project cost not to exceed one-hundred fifteen million dollars ($115,000,000.00). This election will advise the City Council as to whether the public supports proceeding with the Project. The City Council has selected the Sioux Falls Convention Center site as the site to build the Project. The Council has also adopted a resolution stating that it will not proceed with the Project if the proposal is not approved by a majority of those voting in this election. improvements that may be incurred in future years. In order to construct the Project, further action will be required by the City Council to allow the City to issue revenue bonds to be repaid from and secured solely by revenues from the existing second penny sales tax to finance all or a portion of the costs of the Project. A vote “Yes” is for constructing the Project. This proposed resolution goes with the ordinance up for 1st reading on Monday night. Why would the City Council approve this resolution setting out the ballot language before the 2nd reading of the ordinance setting the date of the election and the ballot language? Doesn't this resolution need to be postponed and adopted when the city council adopts the ordinance authorizing the special election? The ordinance and this resolution seem to be out of sync with each other if both continue to contain the actual ballot language. What exactly is the public voting on in November? If you read the "advisory" ballot language, both in the proposed ordinance and the resolution, the language asks the public if they support the construction of the Event Center at a cost not exceed $115M. Putting the $115M in the ballot means if the cost comes in more than that, then the City can't move forward with the construction of the Event Center? In other words, will the vote be binding on the $115M cost? The city's construction manager has not submitted the actual "estimate" construction cost of the Event Center so who knows if the construction figure is $110M, $115M, or $120M or more for construction of the Event Center. Keep in mind, whatever the construction figure turns out to be, the total cost of the bond will be at least $10M or more to cover the reserve and cost to issue the bond. Also, keep in mind that this vote scheduled in November is not binding, no matter what construction figure the city puts in the ballot language. Why put the cost in the ballot language to begin with? It is meaningless. Again, what is the purpose of the vote? What is it the city wants to know from the general public? It's simple isn't, it? Do you want to build an Event Center - yes or no? Simple and to the point. If the vote result is yes, then the city would move forward with the resolution authorizing the issuance of the bonds at whatever cost they (the city and the construction manager) comes up with based on their designs. This would be the time when the construction amounts are important and necessary. If the vote is no to build the event center, then it will all stop per the proposed resolution saying the construction of the event center is subject to the vote of the people and the process to build an Event Center will cease (for the time being). The stage is set Monday night. What about those Pavilion/Convention Center Bonds? When the Washington Pavilion and Convention Center bond is paid off in 2014 the plan is to use the freed up funds to support the capital costs of the Arena and used as a fall back to cover the future capital and operating costs of the new Event Center. Back on August 2, 1993, the City Commission adopted a resolution (Resolution No. 257-93) authorizing the issuance of the sales tax revenue bonds for the construction of the Washington Pavilion and the Convention Center. The resolution stipulated that the 3rd penny entertainment tax be used first against the debt and if the 3rd penny entertainment tax revenues were insufficient, the 2nd penny sales tax would be used as a loan to pay the principal, premium and interest of the project bonds. The resolution goes on to state that if the second penny sales tax is used to pay down the debt of the bonds, it shall be considered a loan and must be repaid to the second cent sales tax fund. This resolution (No. 257-93) was referred by petition of the public and went to a special election vote on October 19, 1993. The Notice of Special Election specifically stated that the bonds will be paid from the net proceeds of the 3rd penny entertainment tax. The 2nd penny sales tax will be used to make payments on the Bonds only if the 3rd penny entertainment tax net revenues are not sufficient. If the 2nd penny sales tax is used for payment of the Bonds, it will be a loan and shall be repaid by the Entertainment Tax. A yes vote meant the action of the City Commission was approved and the Bonds for a Convention Center and Washington Pavilion will be issued. The yes vote prevailed and the bonds were issued and the rest is history. This now brings us to the present and the mayor's plan to use the freed up money after 2014. Was the 2nd penny sales tax used to repay the Pavilion/Convention Center bonds? I have it on a very good source that the 2nd penny sales tax was used to pay off a portion of this Pavilion/Convention Center bond debt. According to the 1993 adopted resolution and public vote, that money needs to be repaid before it can be used for the purposes outlined in the mayor's financing plan for the Event Center. I suppose the city council could pass legislation to forgive the debt but I wonder what the public would think of that, especially since the public voted on how their tax dollars were to be used to pay down the debt of the Washington Pavilion and the Convention Center. You can't watch any news program on TV and not be bombarded with the debt ceiling talks. If what is happening in Washington DC doesn't move you to contact your representatives in Congress, then I think you must live in a closet. It is disturbing to listen to the doomsday predictions and the shrill behavior of those Teapublicans who are hell bent on tying the deficit talks to the debt ceiling action to the detriment of the country's economy. I don't care where you work and who you work for, the common business approach to getting things done is listening, gathering facts, negotiate and establish a win/win environment. That means compromise has to be part of the agenda. When one has to negotiate in this kind of environment, no one wins and everyone is a loser. When you hold one party hostage to your position, it means a breakdown in communication and a failure to succeed. No one is arguing that the deficit has to be dealt with. Nobody is saying that government spending must be controlled. Nobody is saying that cuts must be made. The fact is the debt ceiling is being used as a pawn for the Teapublicans agenda to reduce government spending and to the hell with anyone who hasn't signed Grover Norquist's pledge. By the Treasury Department’s count, Congress has acted 78 times since 1960 to raise, extend or alter the definition of the debt limit — 49 times under Republican presidents, and 29 times under Democratic presidents. Hello, Teapublicans!!!! The debt ceiling is about paying for obligations already incurred. Tying government spending to raising the debt ceiling is a political ploy detrimental to the economic health of the country. This group needs to be sent to time out and be treated as the petulant little bullying brat that they are. Oh, and by the way, Speaker Boehner needs to grow a pair. The city finance director gave an Event Center Bond Financing and Operating Budget presentation to the City Council on Monday, July 18th. The administration continues to assure the public that no new taxes will be required for the funding of the Event Center. We now know that the construction of an event center will be financed through bonds obligating the 2nd penny sales tax for the next 20 to 25 years. The construction costs are estimated at $110M and with the cost for the debt service reserve and issuance of the bond bringing the bond cost to around $120M. The actual construction cost from Mortensen hasn't come in yet, so this is still a moving target. The concern is not that taxes will go up. The concern is that the projected growth of the second penny sales tax will actually occur to meet the $7-$9 million annual bond payment over those 20-25 years and leave enough money to address the current and future infrastructure needs of the city. Historical 25 year sales tax growth figures were used in sales tax growth projections. In the past that historical data was pretty much on target. Today's reality is much different, however. Projections are not reality. Counting on the "horse power" of the 2nd penny sales tax is the foundation of the financing plan. The economy is in trouble and the federal deficit has a serious impact on local reality as well. Where will funding come from if the construction costs exceed the projected $110 million in bond debt and the sales tax growth projections don't materialize? The event center talk seems to be centered on construction, but we also need to focus on the operating costs of the event center once built. The administration assures the public again that taxes will not go up. There is assurance that property tax and first penny sales tax will not be used for construction, debt service or the operation costs of the event center. Private money, along with projected revenue, is to fund the operating costs of the new event center, along with the Entertainment Tax for capital needs. The city intends to lump all three facilities (Event Center, Convention Center and Arena) together for financing purposes in the future. The projection is that after event costs and cost of operation, the operating income will be $1.1M to$2.6M. Repair and maintenance costs and capital needs were not in the expense projections. The Arena lost $123,000 net in 2010 and the Convention Center lost $560,000 in 2010. I guess that means that the Event Center revenues will subsidize the Arena and Convention Center operating expenses and still make a profit of $1.1M-$2.6M? Uses for the 3rd penny Entertainment Tax Fund continue to expand. The Entertainment Tax brings in around $5M. Of that $5M, $2.25M goes to retire the debt service on the Pavilion and Convention Center and to assist in the operation, major repair and maintenance and capital needs of these two facilities. These bonds are projected to paid off by 2014. The freed up funds are to support the capital costs of the Arena and will be used as a fall back to cover the capital and operating costs of the Event Center. In addition, the Entertainment Tax Fund will also now cover the operating costs, repair and maintenance and capital needs of the Orpheum and the Great Plains Zoo. The question is, will there actually be enough money in this fund to go around. Which entity will have first priority for the Entertainment Tax Fund and which entity or entities will go wanting? Will the public know how much private money has been raised for the operation of an event center before the proposed vote in November? The mayor sent out over 400 invitations to the business community to hear his plan last week. I heard 150 actually showed up. I hope those private partnerships are coming in so we can hear how successful he is in "marketing" his financing plan to operate the Event Center and subsidize the costs of running the Convention Center and the Arena. Before I vote on the event center, I want to know if there is actual private money committed to run the thing for the next 20 years and beyond. Can the City Council adopt an ordinance that specifically outlines the funds to be appropriated for the construction and operation of the Event Center? The financial appropriation legacy of this event center will be laid at the feet of future city councils to fund. The repayment of the Event Center bond financing is based on 2nd penny sales tax growth and the operating costs of the Event Center are based on private funding and projected revenues, according to the Mayor's plan. Funding may be based on conservative assumptions, but it sounds more like a hope and prayer to me. The City Council's Fiscal Committee wants to approve city contracts over $25,000. Councilor Anderson wants to bring transparency to the public. The city budget is over $300 million. It is not practical to expect the administration to seek approval on every contract over $25,000. Do you have any idea how many contracts over $25,000 there are each month? City staff is right when they say this will bog down the ability to do city business. City Charter clearly sets out the role of the Mayor and the City Council. The City Council is governing body and is not responsible for the day to day operation of the city. They are treading on territory that is not within the realm of their responsibility according to city charter. All powers of the city shall be vested in the city council, except as otherwise provided by law or this charter, and the council shall provide for the exercise thereof and for the performance of all duties and obligations imposed on the city by law. The council shall act as a part-time, policy making and legislative body, avoiding management and administrative issues. Article III, Mayor, Section 3.01. Executive power. The executive and administrative power of the city shall be vested in a mayor. City Charter, Article V, Financial Procedures clearly spell out appropriation and revenue requirements for conducting business. The City Council approves the budget. Each October, the council approves an appropriation ordinance that sets appropriations by fund and by department for the ensuing fiscal year. City Charter spells out procedures for amendments to the appropriation ordinance after adoption for such things as supplemental appropriations or transfer of appropriations. Clearly, contracts are an an administrative function. If the City Council wants to know more about a project or a budget appropriation they approved by ordinance, then they should ask the administration for a report at an Information Meeting. To pass an ordinance that requires the administration to bring every contract over $25,000 to the City Council for adoption is pure minutiae and inefficient government. The City Council has more important things to worry about than this administrative issue. The finance department puts out mountains of financial information. It is all there, you just have to read it and review it. Ask questions of the administration regarding contracts if you want to know something specific. To just throw all this information on an agenda for approval is not good government. This is not big picture thinking and should not be adopted by the full City Council. The 49th Street Extension Project is a new project in the recommended plan. The summary says this project was top priority identified in the 41st Street Corridor Study to assist with the traffic flow on 41st Street. This street will be a major east/west arterial alternate route. $500,000 for engineering is programmed for 2016. Top priority when only engineering costs programmed in the 2016? No relief for the 41st Street Corridor traffic seems to be on the horizon. The Major Street Reconstruction Program total increased by $6.5 million. However, program year to program year over the previous plan tells an interesting story. Program years 2012 and 2016 sales tax money for reconstruction was increased over the previous plan, but program years 2012, 2014 and 2015 all were decreased in funding over the previous plan. Maybe to free up money to pay those annual event center bond payments? McCart Field and parking lot Project is not in the plan. Why not? What will be the cost associated with this project? The mayor stated this project would move forward whether the Event Center did or not. Event Center project does not show programmed construction costs for each year of the plan. A major project driven by the administration and it's not even in the recommended plan. Why not? The River Greenway Improvements Project had $1.8 million programmed in the 2011-2015 CIP to construct improvements on the east bank of the Big Sioux River using other financing (Big Sioux Environmental fund). The plan showed $25,560 programmed for 2014. The 2012-2016 Mayor's Recommended CIP shows $1.06 million programmed in 2012 for this project using sales tax. Was this project money not spent in 2011 and moved out to 2012 or is this new programmed sales tax money for the project? The recommended plan before the council says a Downtown TIF will be evaluated and may be used to supplement funding of this project. If TIF becomes available, the CIP will be amended. It seems funding for this project is all over the place. Is this project still being worked or is it in limbo? The Indoor Aquatics Development project to be located at the Spellerberg Park location received a funding boost in the recommended plan. It went from $814,000 programmed in 2015 to $5.8 million in total funding in the recommended 2016 CIP. Construction is programmed to begin in 2014. It went from a priority ranking of 43 to project priority #2. This project will replace the current Spellerberg Pool with either an indoor or outdoor family aquatic facility. An indoor facility is a high priority for the Park Board. The City of Sioux Falls Recreation Needs Assessment completed in April 2011 showed that 60% of the respondents felt a need for an indoor aquatics facility. The project justification states the Park department will gauge public demand through neighborhood meetings and feedback coming at large. The Indoor Ice Facility Project had $500,000 programmed in 2014. This project has increased to $1.5 million, programmed in plan year 2013 in the mayor's new recommended plan. This project went from priority ranking #38 to priority ranking #7. The Ice Sports Association will obtain a 99 year lease from Sanford Health to build a facility within the Sanford Sports Complex. The programmed sales tax money will be used to purchase equipment with the city maintaining control of the assets. In return, the public will have use of the facility. Does this arrangement mean the city will be on the hook for future equipment needs of this facility? Will this be an ongoing expense for taxpayers? What exactly does public use of the facility mean to the general public? The $500,000 programmed in plan year 2014 in the current CIP for the Indoor Tennis facility has been moved up to program year 2013 in the mayor's recommended CIP. The SF Tennis Association is expected to obtain a 99 year land lease from Sanford Health to build a facility within the Sanford Sports Complex to be built in northeast Sioux Falls. The $500,000 sales tax money will be used to buy equipment and construct improvements within the facility. The project description says the city will retain ownership of the equipment and improvements constructed in the facility and in return the public can use the facility year round by agreement between the city and the SF Tennis Association. This is kind of a cozy relationship, considering the "first lady" of Sioux Falls is the executive director of the SF Tennis Association. Does this also mean that the city will be on the hook for all equipment, now and in the future? What about those construction improvements? What kind of improvements are we talking about here? What exactly does public use mean? Is that free use by the public. I doubt it. I doubt this will be a one time cost to the city but more likely an ongoing expense. Questions should abound regarding this use of sales tax dollars from the city council regarding this project. This project was ranked priority #37 in the current plan and is priority #6 in the recommended plan. The Indoor Aquatics Development CIP project is very different from the Indoor Ice Facility CIP project and the Indoor Tennis Facility CIP project in that the Indoor Aquatics project is directly in line with the parks and recreation aquatics plans throughout the city. Spellerberg Pool is the oldest pool in the city and is in need of replacement. It is appropriate to look at both indoor and outdoor development possibilities. Aquatics is a program service funded by sales tax to the general public as evidenced by Laurel Oaks Pool, Terrace Park, Drakes Springs, Frank Olson, Pioneer Spray Park, etc. The ice faclility project and the indoor tennis facility project are very different, however. Both of these projects are spearheaded by associations. I understand public/private partnerships. However, these two associations provide sports activities to a very specific group of people, not to the general public as a whole. A one time public support of taxpayer funds is one thing, but should the taxpayers be on the hook for equipment needs and construction improvements to their facilities indefinitely into the future to support these two facilities? There should be serious questions asked and answers given regarding these two projects before the city council approves any public/private partnership money for this two private endeavors. It is hard to listen to all the political rhetoric coming out of Washington DC these days. Congress has been on a spending spree since they found out they had a huge budget surplus over a decade ago. Washington has spent money on two wars, financed huge tax cuts and expanded Medicare. They didn't worry about deficit spending back then. They didn't worry that they were putting debt on our children and grandchildren. Everybody wants the services government provides yet nobody wants to deal with how to pay for those services. The money has been spent and the debt ceiling must be raised to cover the debt. Yet, here they are in Washington arguing about it at the final hour. I am sick to death of a Congress made up of grandstanding politicians who are constantly pandering to their base instead of really carrying about the American people - all the American people, not just the people of their own party. There are hard decisions to be made to get this deficit under control. It didn't happen yesterday. It has been years and years of spending by the very people who are now vilifying the party they love to hate, whichever party they are not a member. The current state of politics is going to ruin this country. This notion of my way or the highway is destructive. Michelle Bachman wants to vote no on increasing the debt ceiling. What planet are these people on. She comes from the state of Minnesota who has done that very thing. Minnesota used to be a progressive state and look where it is today. Shut down, closed doors, barricaded buildings and roads. It is a sad commentary on the failed government of Minnesota and its leaders who can't or won't solve the problem. Former Govenor Pawlenty left Minnesota with a huge deficit and now he wants to be the leader of his party to run our nation. Pass the debt limit and then get serious and solve this problem. People in Washington live lives that don't resemble the life the rest of us must face each and every day. Is that too much to ask our representatives in Congress to pay their bills. It sure seems like it is. There has been kind of an evolution regarding the River Greenway project over the last 3 capital improvement programs. The CIP River Greenway Project incorporates the vision outlined in the 2004 Greenway & Riverfront Master Plan. This Master Plan is an interesting read and clearly set out a greenway vision for the entire city back in 2004. The plan broke out various zones, with the Downtown Riverfront identified as Zone 1. Two concepts were identified, with Concept A including an event center, along with retail and hotel/residential uses. Concept B identified uses without an event center. The City Council approved a resolution that allowed the Mayor to enter into an agreement with Zip City Partners LLC that gives the City an option to purchase property on the old Zip Feed Mill site for the construction of an events center. As a consideration, the City agreed to make improvements on City owned property adjacent to the Zip City Partners property and construct a pedestrian bridge connecting the east and west banks of the Big Sioux River. This project follows the conditions of the agreement and encorporates the visions of the adopted Sioux Falls Greenway and Riverfront Master Plan. The master plan also identified a need for shaded rest areas along the recreational trail. These station points would also provide way finding information, mile markers, drinking fountains, and related amenities. improvements the public wanted to see along the Big Sioux River Greenway. This project will construct those improvements on the east bank of the Big Sioux River from Falls Park to 6th Street. These improvements consist of seat walls, a bump out into the River, widening the bike trail, lighting, ramps down into the greenway from 6th Street and various landscape improvements. These improvements will clean up the greenway corridor, provide better access to the river, and use the river as an amenity to draw people downtown. This project will use the Big Sioux Environmental Fund to fund construction. The master plan also identified a need for shaded rest areas along the recreational trail. These station points would also provide way finding information, mile markers, drinking fountains, and related amenities. improvements the public wanted to see along the Big Sioux River Greenway. Surety redevelopment site and other redevelopments as applicable. Master plans are important to the future vision of any city. They become living documents, a road map, for city and elected officials. It appears elected officials and city officials don't refer back to adopted master plans as they set their own agendas. City officials change; elected officials rotate in and out every four to eight years. Continuity in planned vision is supposed to happen with master plans but who knows if that actually occurs when elected officials come in with their own pre-conceived notions regarding their "vision" for a city. 2004 was a long time ago and things evolve, no doubt about it. Funding of this project seems to be evolving plan year to plan year.You be the judge on where you think this project is going and if this project is being completed as envisioned back in 2004. Phases II and III are in progress and Phase IV is ongoing. Phase II consists of a new rail switch yard and construction to replace tracks in the downtown area. Phase III is also related to the rail construction replacement in Downtown and new construction of the main line. Phase IV is working on an agreement between Burlington Northern and the city regarding eliminating grade crossings throughout Sioux Falls. In 2008 the 57th Street grade crossing was eliminated with the construction of a bridge over 57th Street. The 69th Street Bridge will be completed in August 2011. This phase will look at potential future crossings throughout the city. The meat of the Master Plan, however, is Phases II and III dealing with the downtown rail relocation. It appears the sticking point in this project is the environmental assessment. The Feds appropriated $40 million for this project in 2006 and there is something like $38 million remaining in the allocation. This money is not sitting in a city account. The money remains with the Feds through the FHA who will authorize the release of the funds when the city signs a contract related to the project. Councilor Jamison asked if this was a city project and the reply was yes with reservation. It was stated that the Environmental Assessment is the key to getting the federal dollars. If this was purely a city project funded with city funds, there would be no need to do the EA. City staff is currently working on the Environmental Assessment which entails multiple design meetings to identify feasible alternatives and meetings with the major stakeholders. It is taking a long time to make progress on the Environmental Assessment. The city added a new alternative in this update - the Canton Line in Southeast Sioux Falls. They said the reason for adding this alternative as feasible is because of the 57th Street Bridge and the new bridge currently being constructed across 69th Street. Councilors expressed some concerns/questions regarding this new alternative. I was glad to hear their concerns considering the city is thinking about moving the main switching line to the residential southeast area of Sioux Falls which is a growing residential area. If you live in the central or southeast part of Sioux Falls, then you are familiar with the trains that travel the Canton line into Sioux Falls. These trains travel this line at all times of the day and night but they especially create havoc when they move through town around 7:30 or 8 a.m. or close to quitting time at work. It's nice that there is bridge over 57th Street but those trains have to travel over the 49th Street grade crossing, the 26th Street grade crossing, the 14th Street grade crossing and the Cliff Ave. grade crossing on it's way to the downtown rail yard at 8th Street. The traffic disruption when those street crossings are cut off is atrocious and has a major impact on the eastside. A switch yard on the Canton line in southeast Sioux Falls would now mean the train traffic will double what it is today. Instead of switching in downtown as they do today, the trains from all the quadrants would have to travel through the central and southeast part of town out to the new Canton switching line and then travel back to where they want to go. When trains now travel the Canton line through southeast and central Sioux Falls over those grade crossings, the trains cut off all traffic in that entire corridor. How is that progress? How is that an improvement? The impact to the quality of life in southeast Sioux Falls will decrease with this alternative site. Now the residents in that area of Sioux Falls will hear double the train noise and horn tooting anytime day and night. What are they thinking? They said the reason for this new alternative is to minimize the falls area and cost. Cost, that pesky factor in anything the city does these days. Evidently there is not enough federal money for the bridge allocation in the falls park alternative. There might be barely enough money for the siding option but the fact is the city could have to provide additional dollars to the federal allocation to get this project completed. That means 2nd penny tax dollars in the capital program or bonding. That might explain the new alternative using the Canton line as a solution, sacrificing the quality of life for the southeastern section of the city. Quicker and cheaper, affordable and prudent - that may be the continuing line down at City Hall. Forget the fact that a huge residential part of the city will have to sacrificed for this progress. It was said that the Ellis & Eastern Mainline yard was already determined as feasible. So why are we considering the new Canton line as an alternative if there is already a feasible site? Over the next 90 days, city staff should be able to finalize the design work. The next update is October 3. Two public meetings will be held in November 2011 and May 2012. The draft EA will be ready by January 2012 with the final review and approval by September 2012. People need to start paying attention to this project. More rumbling trains, tooting horns and major traffic delays may be in your distant future if you live in southeast Sioux Falls and the surrounding area. Whose Parade and Picnic Is It? The sixth annual Mayor’s Fourth of July Family Parade and Picnic at Falls Park was held last week-end. It's a nice event for the community started by former Mayor Dave Munson to celebrate the birth of our nation with the citizens of Sioux Falls. People are treated to free food and entertainment. 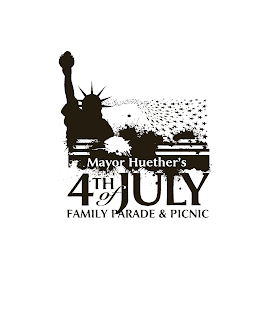 This year's annual national birthday event was billed as Mayor Huether's 4th of July Parade and Picnic. This artwork was on the T-shirts worn by volunteers at this year's 4th of July Parade and Picnic. I wouldn't necessarily have commented on this but people have mentioned it to me and asked why he would name the parade and picnic specifically after himself. The moniker "mayor" is the name of the office, not a person. I suppose there are people out there who don't know who the mayor of Sioux Falls is so he needed to let people know that it was "his" parade and "his" picnic. South Dakota Straight Talk has an interesting take on the Event Center debate and Plan B. Today, Build It Now SiouxFalls held their first press conference to announce a grassroots campaign to convince voters to support building an event center at the Arena/Convention Center location. The organization's objective is to specifically get the vote out this November. It is an impressive group of co-chairs, especially the representatives from the two health systems in town. The press conference was lead by Mike Sullivan who stated it would be run like a political campaign. He stated he had just flown in from Florida last night. Sullivan said they were not affiliated with the mayor or city council. Yet, I am told Rolfing, Entenman (standing with a Build It Now Sioux Falls sign) and the mayor all stood in the back smiling and happy. Sullivan, when asked by the media to name the top 3 benefits of "building it now" at the arena/convention site, stated the top reason was the economic impact on Sioux Falls and that Sioux Falls needed to keep up with other cities in the region. Kelley from Gage Brothers had to actually fill in the third benefit for him which was to build it for the younger generation. All co-chairs spoke and all had a central theme - those darn pesky tail lights going down the interstate to Sioux City or Omaha or up the interstate to Fargo. Sullivan said if we build a quality place, get quality events, then they will be there. He stated Sioux Falls has always been the leader of South Dakota; that he wasn't just talking about Sioux Falls but talking about all of South Dakota. He said the economic boom is going to come to Sioux Falls. People are going to spend the night here, go to restaurants, go to the bars, gas stations and stop at convenience stores. Well, I submit to you that the visitors from outside Sioux Falls, not the ones who will drive in and drive out, but the ones who might just stay, will have to travel a bit to get to some of those amenities. Let's not forget that the mayor has said that he is building it for the 60% who are from out of town - the very people who want to drive in and drive out easily. Maybe it should be titled The In and Out Event Center. The last time I read the AECOM Economic Report, the economic boom at the Arena/Convention Center location was dismal in comparison to the economic boom of the Downtown Cherapa Site. But hey, why confuse anyone with the facts, right? It's all about building it fast! Sullivan said so - so did Amdahl and Kelley. Amdahl and Kelley rang the alarm bell on the increasing construction costs if we don't get this done fast. Sullivan introduced Alan Amdahl as Adam Amdahl which Mr. Amdahl had to correct when he got to the podium. Here we have a seeminly close knit group who didn't really seem to be working as a cohesive group at this their first press conference. Also, it might help if the co-chairs knew the name of their own group. It's not Build It Sioux Falls.....it's Build it Now Sioux Falls. Amdahl stated that it is the opportune time to build the event center because the interest money is cheap and affordable. He stated we need to vote now, not in April 2012 or November 2012. Material costs are going up 6% per year and over 5 years from now costs will go up $30 million. He said we need to push for a November 2011 election and build it as soon as possible. Kelley says the city is not sacrificing anything. He reiterated the increasing construction costs as the reason to vote now and build quickly. He said all boats rise in a high tide. He seemed to be the finance guy of the co-chairs. He said they will get the true facts out. The website states the City will provide the down payment. No, the fact is the City intends to bond the entire construction cost of the project. The site says private funding will also be raised, through naming rights, sponsorships and donations. That is actually the plan if they hire Superlative or some other sales/marketing group. The site says the City of Sioux Falls estimates this to be between 15 and 25 percent. Well, that estimate pertained to the mayor's originial funding idea which was going to be used for the down payment. Now the naming rights, sponsorships and donations will be used to fund the annual operating costs of the event center so as not to put a subsidy drain on the city's future operating budget. Sandford USD Medical Center's Dr. O'Brien stated that Sandford Health brings in hundreds of people to their facilities and they tell people what a wonderful community Sioux Falls is and what the city has to offer. Yes, both medical facilities are ambassadors in the community and we have much to be proud of when it comes to both Sandford Health and Avera McKennan. But really, these people who come to Sioux Falls through the hospitals/clinics are here because they have a loved one who is seriously ill. Sure they may fill up the hotels around town, but just how much shopping, event going and bar hopping are these people really doing. I can tell you that when my mother was being treated for cancer in Minneapolis, my family members spent every waking moment at the hospital with her to finally drop in bed at night and get up and sit by her side again the next day. Bar hopping, going to restaurants and going to events were the last thing on our minds. Nicki Ellerbroek basically said what the others said about building it now, what an economic boom to the community, etc. etc. etc. She did admit she was eight miles away from the Arena/Convention Center. I am wondering how all those out of towners are going to find her bar way out on the southeast side of town at 69th and Western. We did learn, however, that her Irish Pub was Sullivan's favorite place when he was in town. I looked at the list of business supporters to date on the organization's website . A lot of the businesses listed are owned by one person. I suppose listing the businesses separately makes it look like the business supporters are bigger than what it actually represents. They've got Sanford and Avera, but other big name and family owned businesses in this community are missing. To be fair, it is the beginning of the grassroots campaign to get it built in a hurry. What I would really like to see is a clear sign of support by these co-chairs and their businesses to pony up some significant part of the $26.2 -$48.3 million related to the Event Center title sponsorship, premium sponsorships and luxury suites based on a 20 year cycle. Then maybe their grass roots support of getting out the voters and building it in a hurry at an area that AECOM even said was beat economically by the Cherapa site might help me understand their position to push to build in an area that has no successful economic past. Isn't it funny too, that they couldn't come up with a more original name for their grass roots campaign. Build It Now Sioux Falls sounds a lot like Build it Downtown. But hey, let's not confuse the voters, it's all about getting the facts out and getting it done in a big hurry. Will the proposed funding for the State Theatre be revealed today?